Mohamed Nanabhay è il capo di Al Jazeera online in lingua inglese (AJE) con sede a Doha, in Qatar. E' entrato in Al Jazeera nel 2004 ed è attualmente anche direttore capo del sito web. In precedenza Mohamed ha fondato Al Jazeera Network’s New Media, dove era a capo di un team interdisciplinare focalizzato sul coinvolgimento del pubblico attraverso le comunità online e le tecnologie emergenti. Grazie al suo lavoro on-line ha vinto numerosi premi da Google, ISACA, Microsoft e Global Internet Access. Il suo lavoro e le sue idee sono state pubblicate sul New York Times, sul MIT Technology Review, BusinessWeek, Wired e sulle più rinomate pubblicazioni d’informazione. Partecipa a convegni ed eventi del settore in tutto il mondo. Dal 1995 fornisce finanziamenti e tutoraggio alle nuove imprese internet. Prima di entrare in Al Jazeera, Mohamed ha ricevuto il premio Thomas Fitzgerald dalla Information Systems Audit and Control Association (ISACA) per gli straordinari risultati nel campo della sicurezza dell'informazione. Mohamed Nanabhay is the Head of Online at Al Jazeera English (AJE) based in Doha, Qatar. 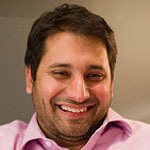 He joined Al Jazeera in 2004 and is currently leading AJE's online operations and serves as the website Editor-in-Chief. Previously Mohamed founded the Al Jazeera Network's New Media department, where he led a cross-disciplinary team that focused on engaging audiences through online communities and emerging technologies. His work online has won him awards from Google, ISACA, Microsoft and Global Internet Access. Mohamed’s work and ideas have been featured in the New York Times, M.I.T. Technology Review, BusinessWeek, Wired and other leading news outlets. He is a regular speaker at industry events and has spoken around the world on online media and innovation, including the United States, Australia, Japan, Holland, Qatar, South Africa and in Second Life. As an internet entrepreneur, Mohamed has been involved with developing online properties since 1995 and is an active angel investor, providing seed funding and mentorship to early stage internet companies. Prior to joining Al Jazeera, Mohamed worked at KPMG where he provided security, privacy and continuity consulting to South Africa's leading businesses. In 2005 Mohamed was awarded the Thomas Fitzgerald Award by Information Systems Audit and Control Association (ISACA) for outstanding achievement in the field of information assurance. Mohamed has studied Computer Science and History at the University of the Witwatersrand (South Africa) and International Relations at the University of Cambridge (UK).